India’s 4G experience is all set to get more exciting with the launch of ELITE 4G from the house of Swipe. The new launch in Swipe’s celebrated ELITE series promises to offer an unmatched 4G experience to the aspiring Indian youth. The value for money device is expected to cater to the need of the hour by offering cutting edge technology at an astounding price of Rs. 3,999/- for 1 GB RAM. Swipe ELITE 4G comes with 5’’ FWVGA Display that is made of Gorilla Glass, ensuring great performance throughout. The scratch and impact-resistant qualities in Gorilla Glass, combined with its incredibly thin profile, enable it to protect device displays without adding significant weight or interfering with ELITE 4G’s capacitive touch screen. 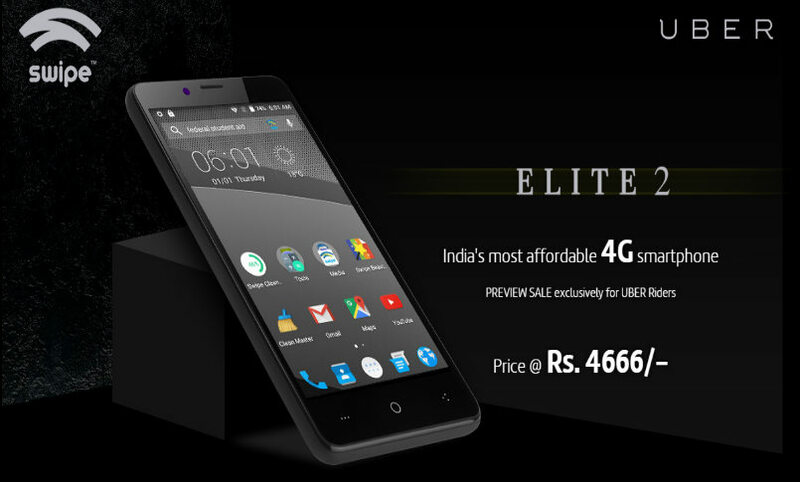 With an incredible design, ELITE 4G is available in Black, Grey & Gold color variants. Its ergonomically-enhanced design gives this iconic smartphone a cool look and great feel in the hands of the user. ELITE 4G is powered by 1.3 GHz Quad Core Processor and loaded with Android 6. All new 4G VoLTE-enabled ELITE 4G comes with an internal memory of 8GB (expandable up to 64 GB). The users will be able to enjoy a greater multimedia experience as they can capture sizzling photos and videos in virtually any lighting condition through its 8-MP Rear Camera. Its 5 MP Front Camera ensures great Selfies to share on various social media platforms. The high-power 2,500 mAh battery ensures that the users do not run out of juice too soon. The battery is rated to give up to 11 hours of talk time and lasts up to 100 hours on standby mode. The ELITE 4G is a dual SIM. Connectivity options include Wi-Fi, Bluetooth, FM Radio, 3.5 mm Audio port, and Micro USB 2.0 port, 3G and 4G (with support for Band 40 used by some LTE networks in India). 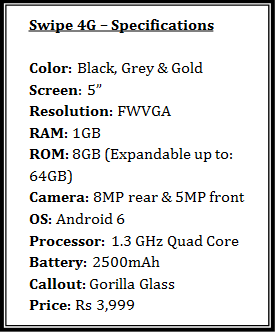 Despite packed with an attractive design, Gorilla Glass and superlative software and hardware features, like all of Swipe products, ELITE 4G is priced competitively at Rs 3,999/-. The Swipe ELITE 4G is available exclusively on Flipkart.com from 16 August 2017.